Lauren Gill is a Certified Family Nurse Practitioner. She graduated from the University of Michigan with a Bachelors in Science of Nursing in April of 2007. She then worked at Riley Children’s Hospital in Indianapolis in the pediatric intensive care unit for four years while completing her Masters in Science of Nursing. She graduated from the University of Cincinnati in September 2011 and became board-certified as a nurse practitioner in January of 2012. 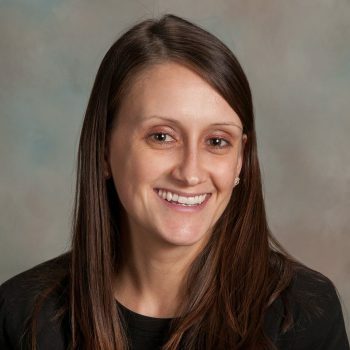 She trained to specialize in dermatology with Dr. Andrew DuBois for five months and has been working alongside him since, serving Greensburg, Batesville and the surrounding communities. I really enjoying educating my patients about ways to prevent aging, sun damage, and how to care for their skin. Staff is very knowledgeable friendly. Not the greatest at getting prescriptions sent when supposed to as we are still waiting on a prescription to be sent from a visit 4-3. I just gave a recommendation for Lauren Gill to my in-laws today! Thank you! My visit with Lauren Gill was a great experience. My exam was thorough and they got me in & out quickly. The Staff and Dr. Hill were helpful and pleasant. My first Dermatologist visit. Everything was wonderful. Lauren is a great NP. The entire Forefront staff was very friendly, courteous and professional. I received friendly, professional and efficient service. Very efficient and compassionate staff! It was a great experience and I would definitely recommend Lauren Gill to anyone needing dermatology care. My appointment was exactly on time, and I was in and out in 15 minutes! I recently was seen by Lauren Gill in the Greensburg office. I appreciated Lauren and her professionalism and the staff very friendly and courteous. I would recommend her for dermatology needs. Thank you. Lauren Is wonderful about listening and not making you feel rushed which is very important. Don't get that much anymore in healthcare unfortunately. Highly recommend her.